Eat happier with foods and recipes that are proven to boost your mood. Some foods taste so good while we're eating them, but can leave us feeling blah, bloated and feeling guilty just moments after we've brushed away the crumbs. But other foods are scientifically shown to lift our spirits. Here are five foods that will make you feel good right away. An ounce of walnuts has four grams of protein (which fills you up and helps keep blood-sugar levels steady) and two grams of fiber (also helps fill you up), according to New York nutritionist Elisa Zied, registered dietitian and author of "Younger Next Week." They're also a good source of magnesium and phosophorus: Having low levels of magnesium has been linked to increased risk of depression, while high levels of magnesium have been linked to reduced symptoms of depression. Walnuts also contain cell-protecting antioxidants and are low in carbohydrates, which means they won't cause a spike in blood sugar and insulin. "Insulin spikes are a reason people's moods crap out, particularly in late afternoon," said Dr. Drew Ramsey, assistant clinical professor of psychiatry at Columbia University College of Physicians & Surgeons and co-author of "The Happiness Diet." "[Kale] is one of the healthiest foods on the planet," said Ramsay. 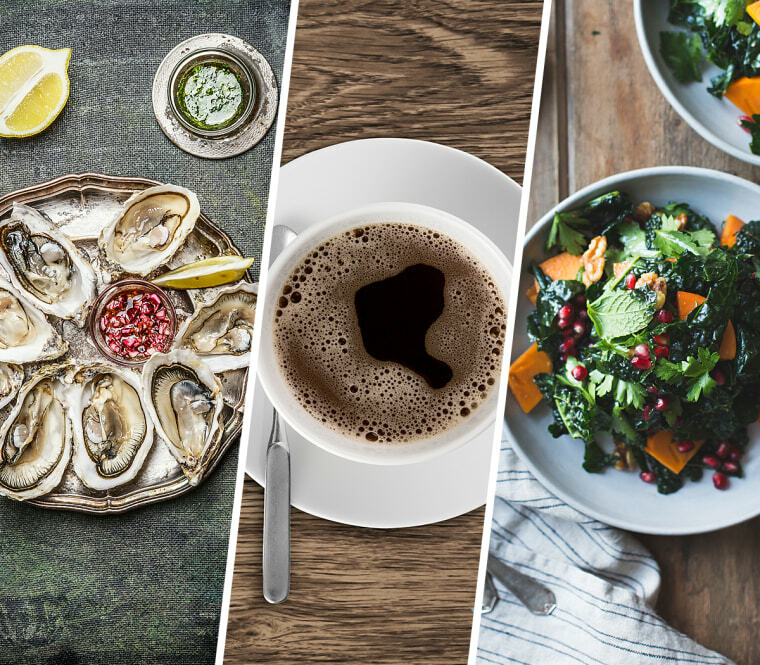 "Oysters are incredibly low in calories and decrease inflammation," says New York nutritionist Bonnie Taub-Dix, R.D. and author of "Read It before You Eat It." Taub-Dix says oysters are heart-healthy and contribute to that great feeling after eating because they improve overall circulation. Oysters are also very high in essential nutrients like omega-3 fatty acids. And, of course, they've long been considered an aphrodisiac. "Oysters are always on the menu around Valentine's Day," says Taub-Dix. Ramsey calls oysters the "perfect brain food." "Dark chocolate is one of the biggest mood boosters," said Ramsey. Dark chocolate not only provides immediate eating pleasure, but it has a high percentage of cacao, which has more antioxidant power than many other foods.